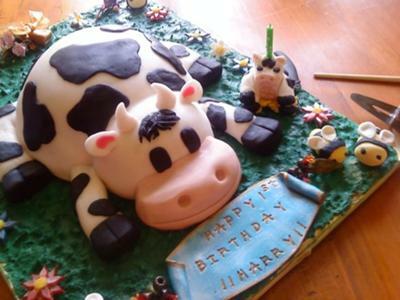 To make this cow cake I used my own mud cake recipe and tripled it. I make my own vanilla fondant and bought black fondant. It is easier than trying to make it your self. To cook the round body I used a deep glass Pyrex dish large and a small glass one to make the head. I cut the small one in half and put it up against the body part on the board that I was severing it on and then covered it with about 2 1/2 kilos of white fondant icing and smoothed it down with a fondant smoother to get it smooth. To get the mouth and nose I colored fondant with copper color and used a ball tool to make the nose and cut the mouth with a knife. For the legs I rolled a long sausage and then cut them on an angle to get them to sit smooth. I cut out black fondant and made any shape I thought look like a cow patch and put them on with a little water to sick them on. All the flowers and bees where also made from fondant and the board was covered in royal icing. i love this cake so much it fantastic !! would you be able to deliver one to england ?